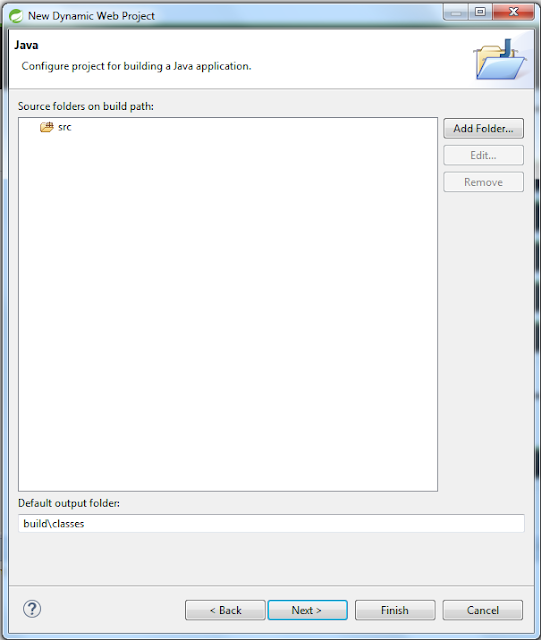 The Spring Tool Suite is an Eclipse-based development environment that is customized for developing Spring applications. 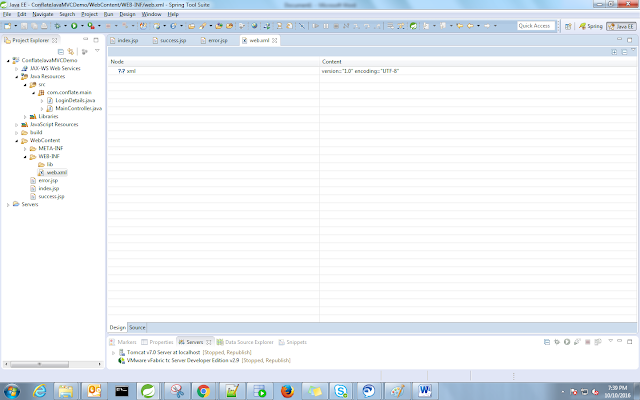 Click to download ‘SPRING TOOL SUITE’. 2.Once downloaded, double click to install. Click next, Accept License, Click Next, Select Installation Path, Click Next. 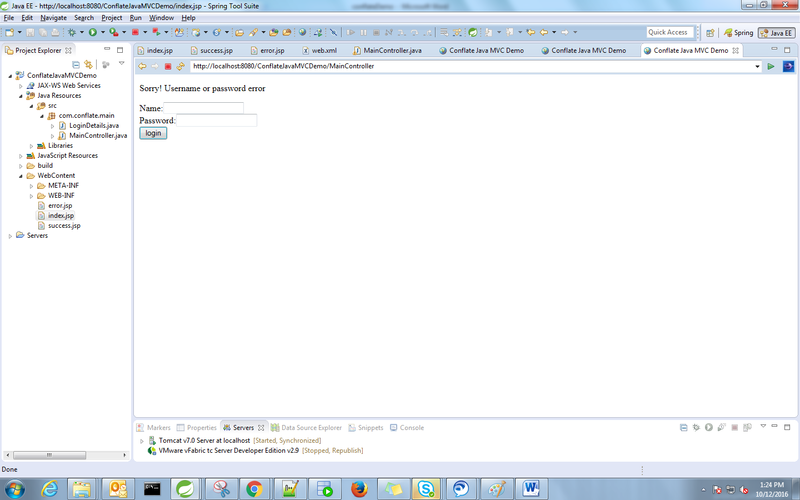 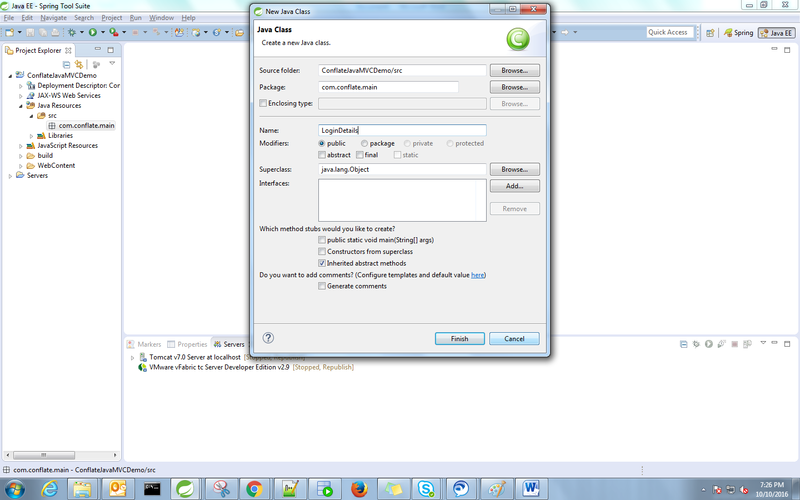 3.Select defaults including tc server and click next. 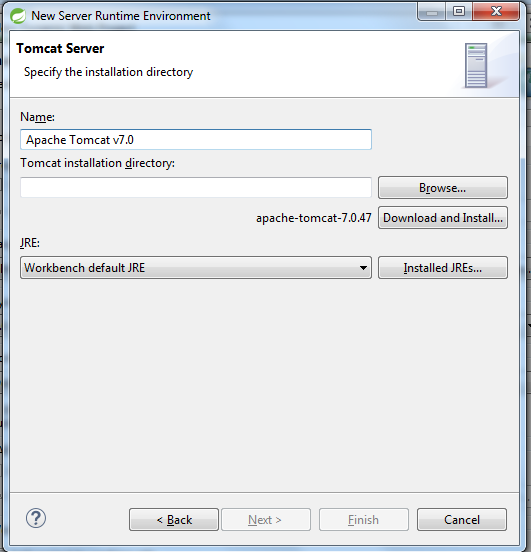 STS includes its own version of Tomcat called tc-server. 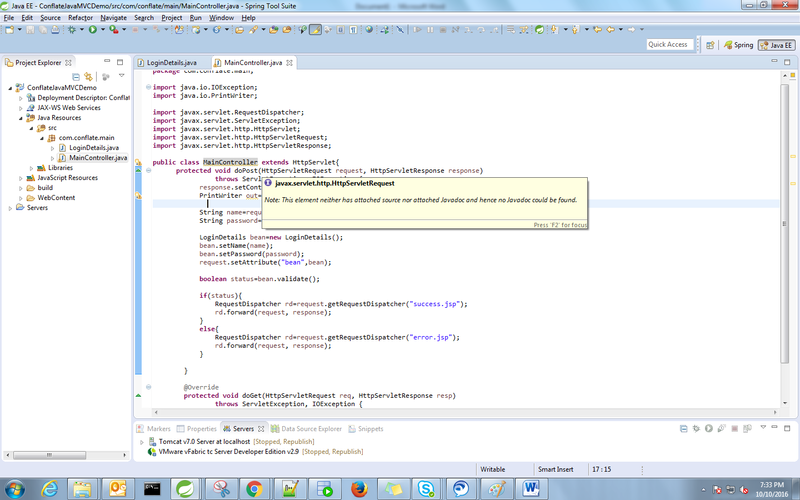 4.Select a JDK (not JRE) and click Next. 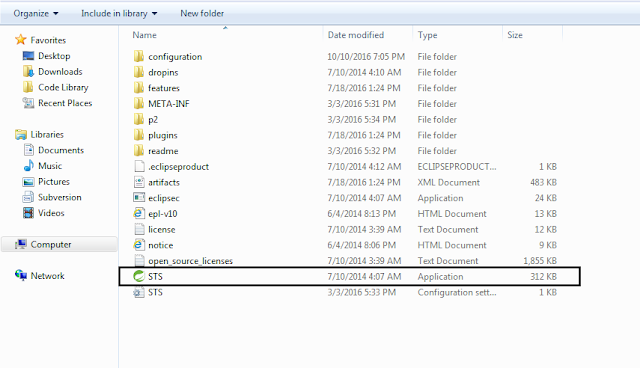 5.Continue to Click Next leaving defaults until the last page, where you can select Launch STS and click finish. 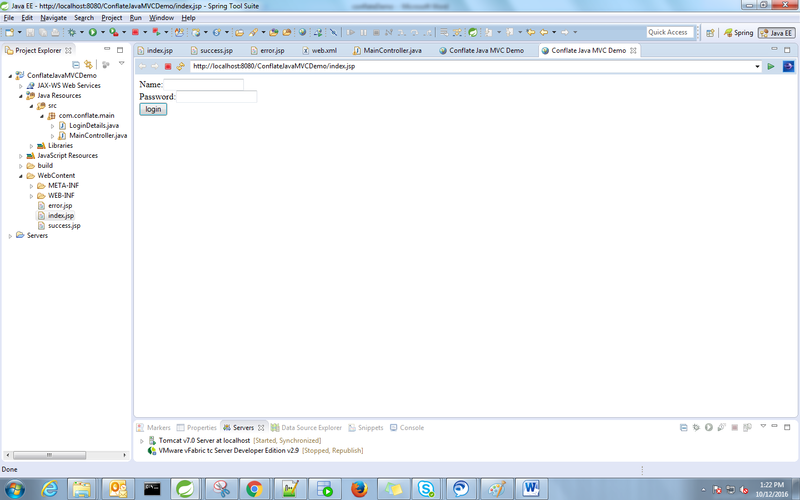 6.Double click the STS icon shown below to start OR Right click and select Open . 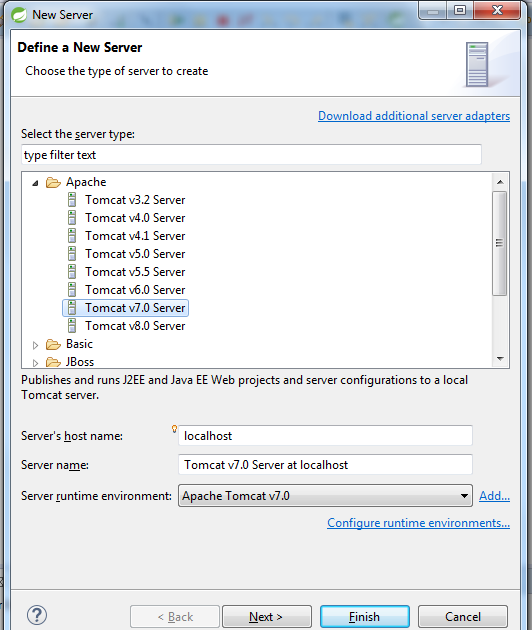 Apache Tomcat, is an open-source web server developed by the Apache Software Foundation (ASF). 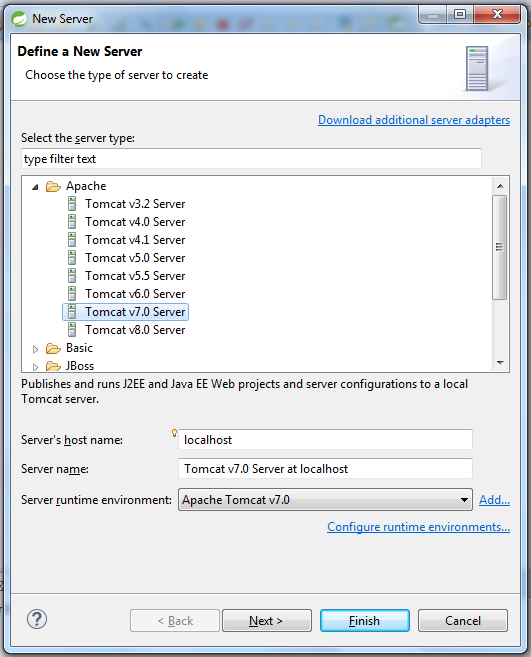 Tomcat implements several Java EE specifications including Java Servlet, JavaServer Pages (JSP), Java EL, and WebSocket, and provides a "pure Java" HTTP web server environment in which Java code can run. Extract the zip folder can copy the path up to the folder containing bin. For eg:- C:\Users \Documents \Applications\apache-tomcat-7.0.54 . 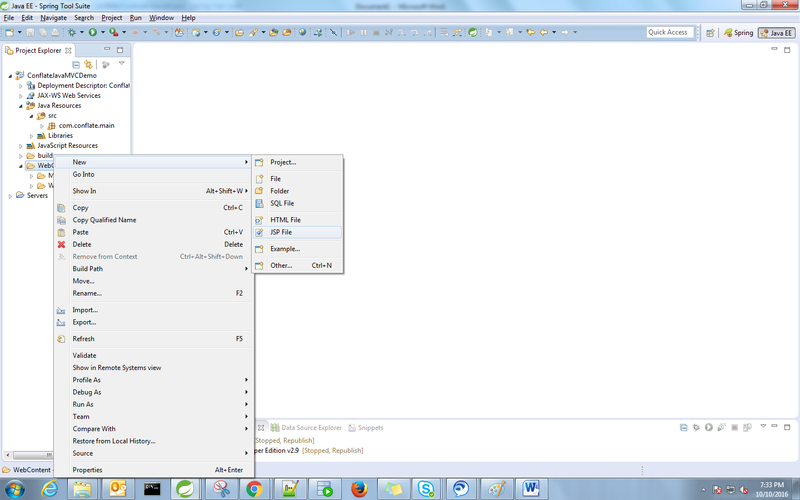 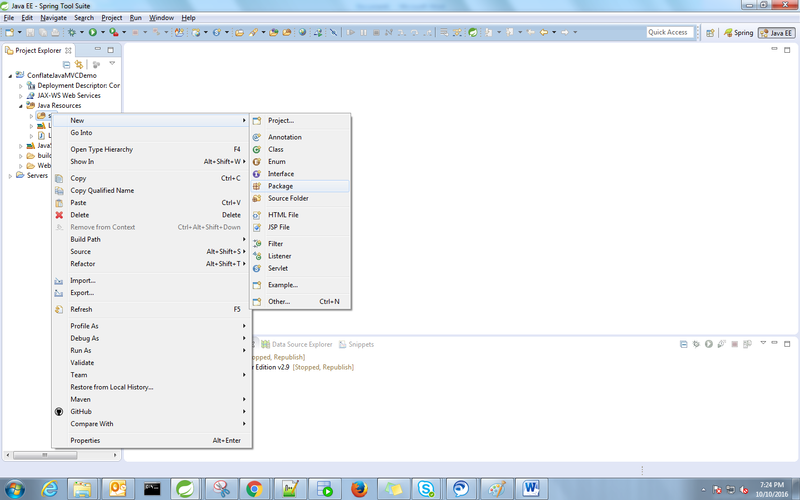 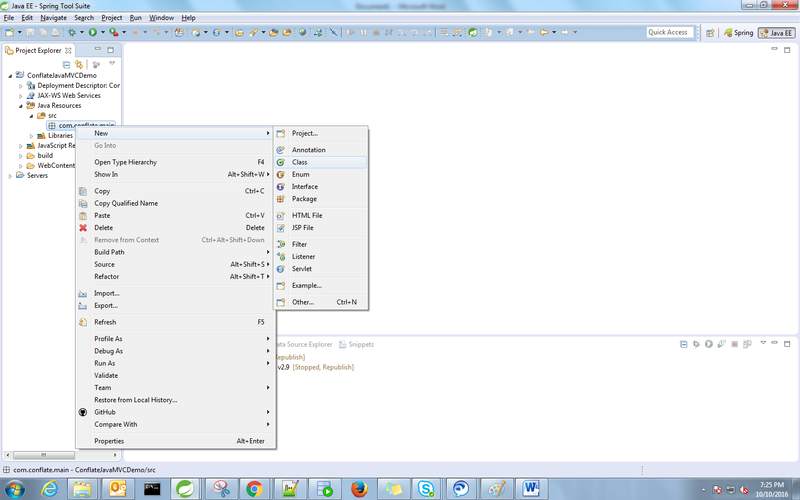 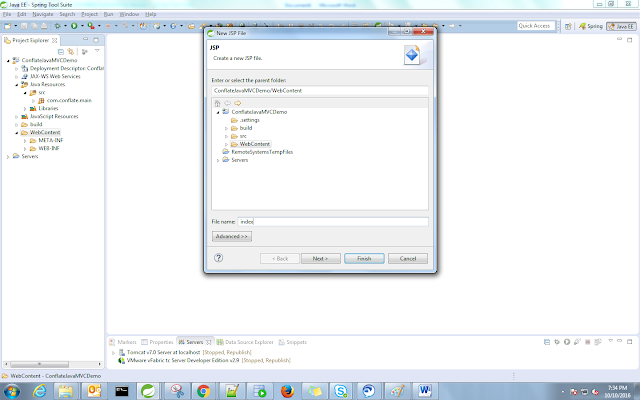 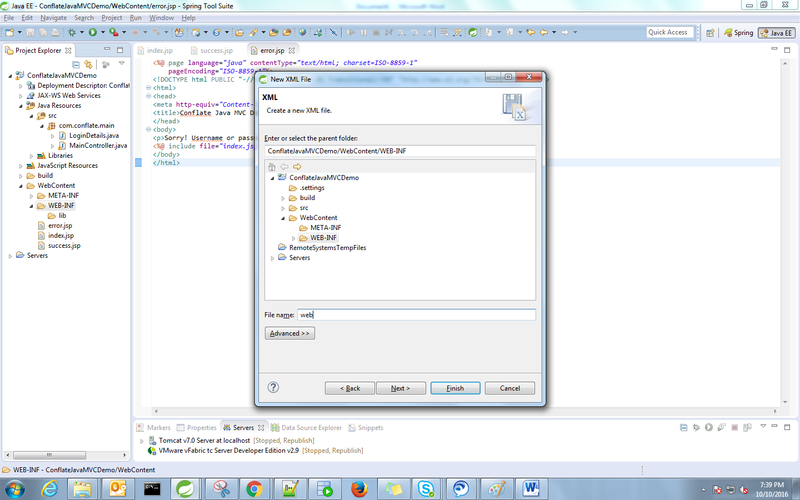 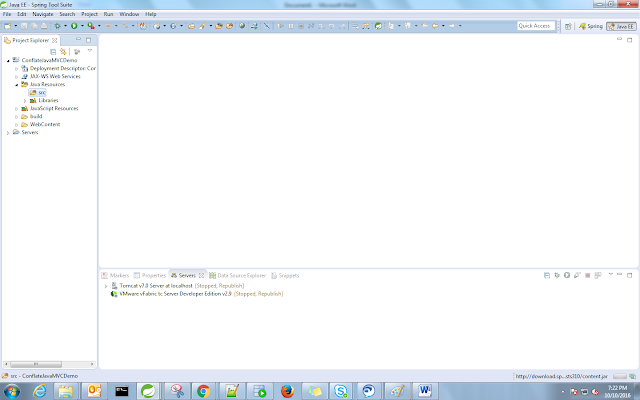 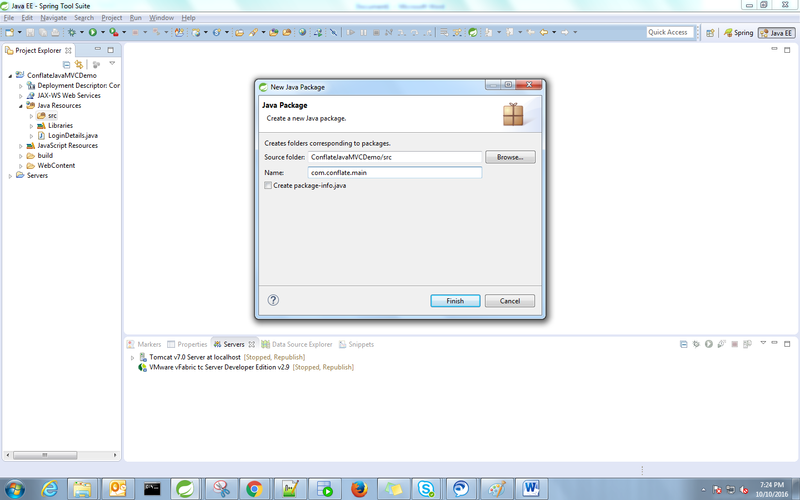 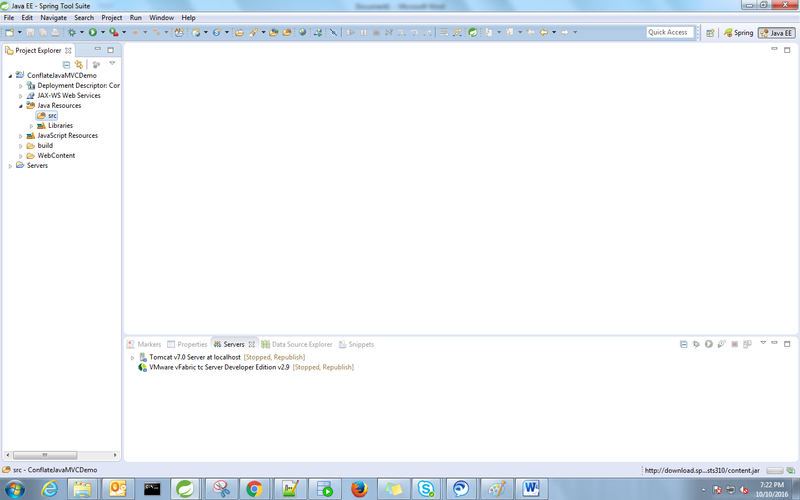 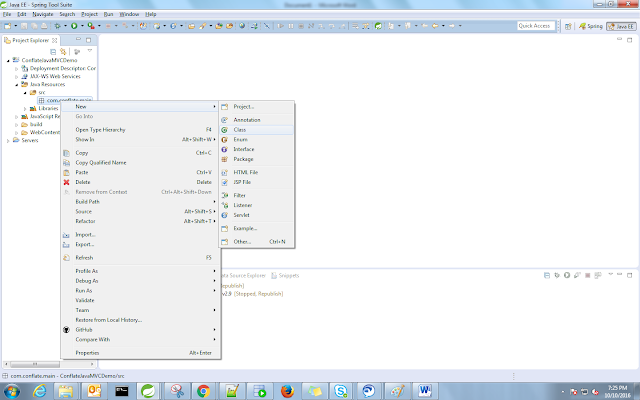 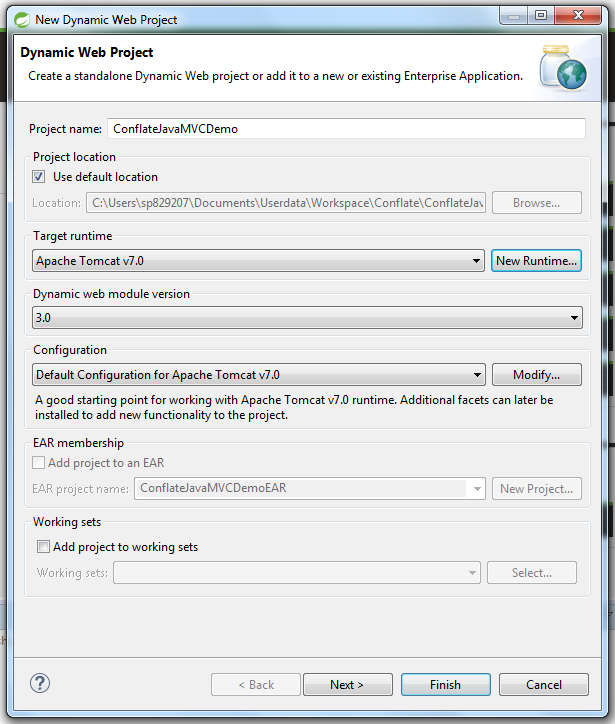 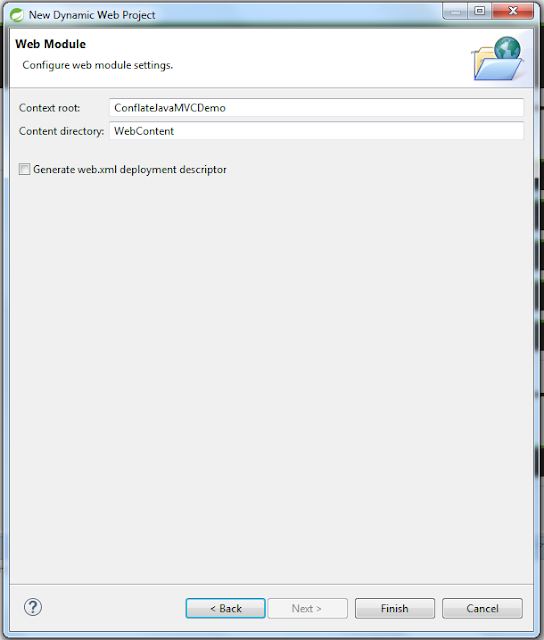 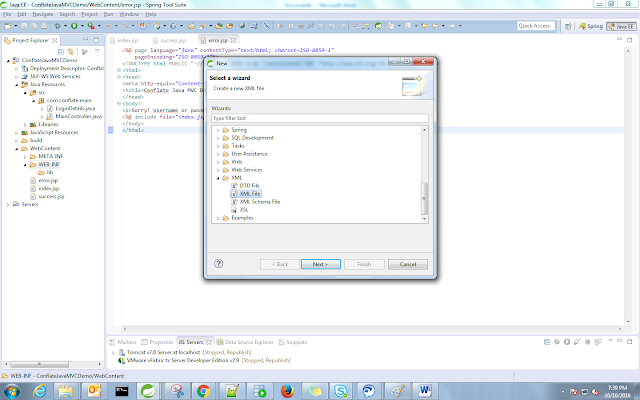 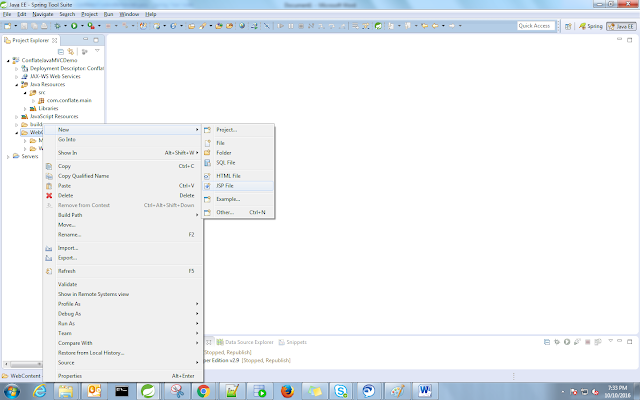 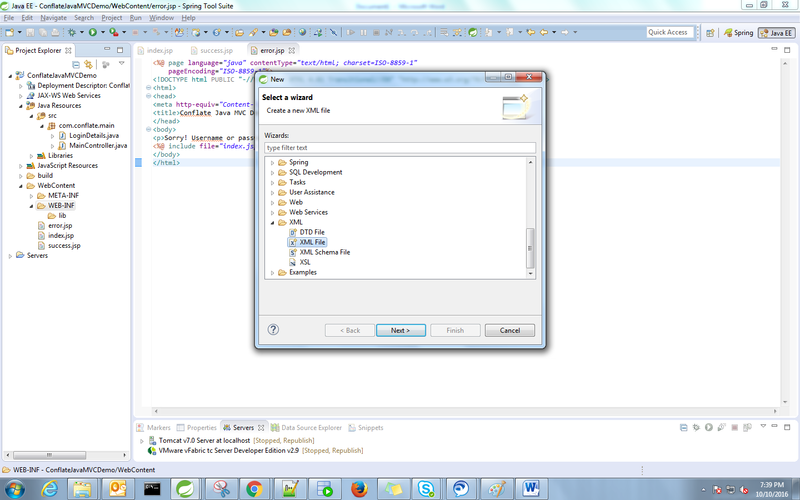 While starting, STS will ask for workspace, like eclipse. 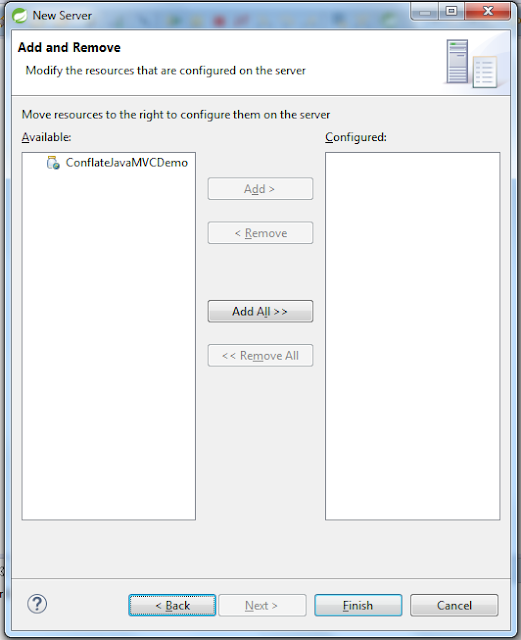 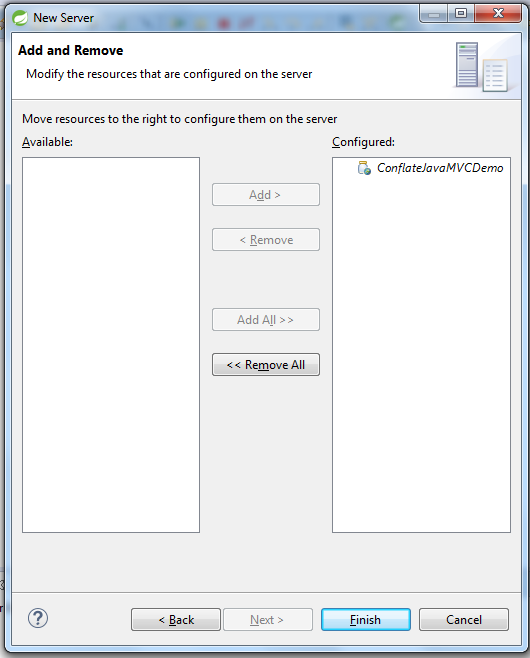 Select resource which we want to configure on server, here in our case only one resource is there, so we can select “AddAll”. 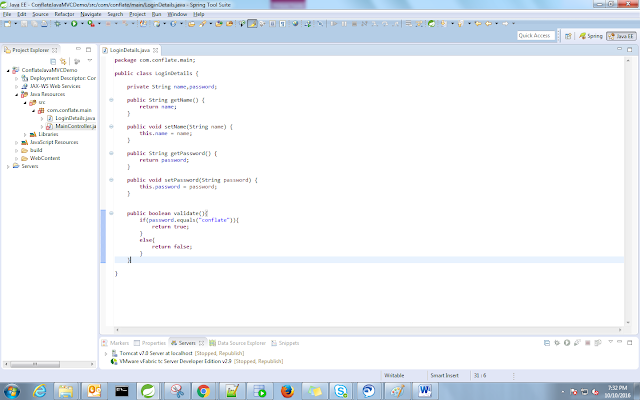 LoginDetails is the bean class where we declare the variables and add getter and setter of it to access the value easily . 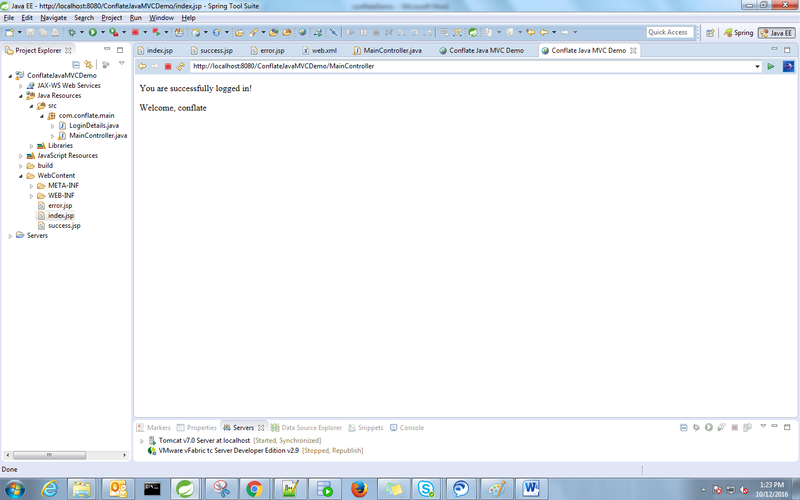 We have one more method validate(), which is used to validate a user by validating the user entered password with the defined one. 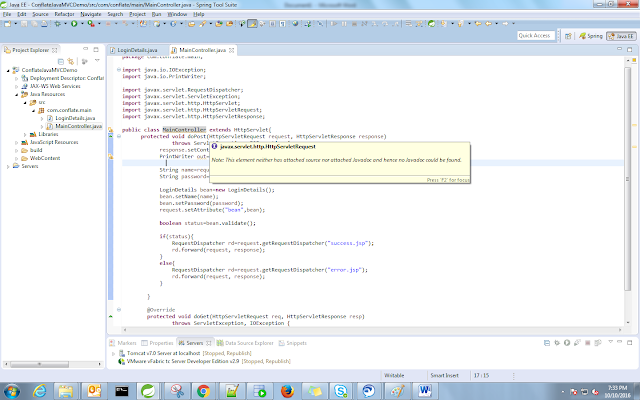 Method will return a boolean value. 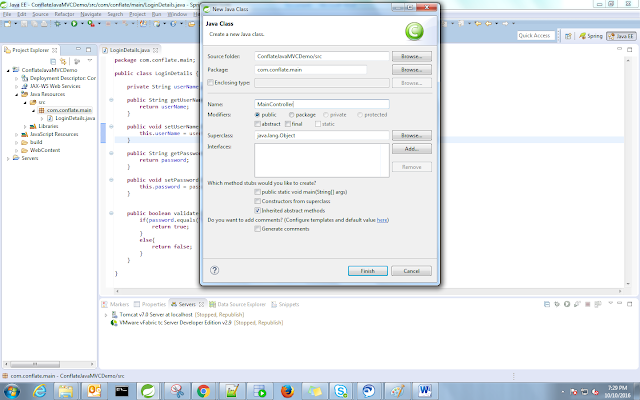 Controlller will receive the user entered details by request.getParameter() method . 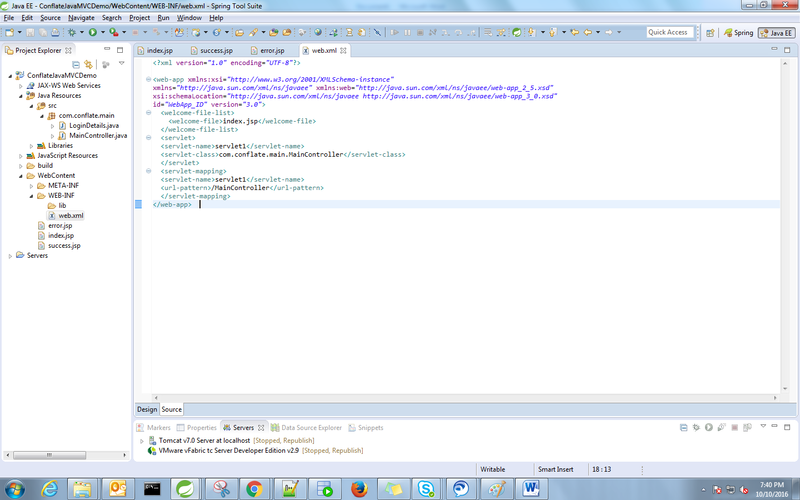 This method willl have parameters same as the name we specify in the jsp file. Using RequestDispatcher object the response is shown according to the request. Index.jsp will help to take inputs from user. 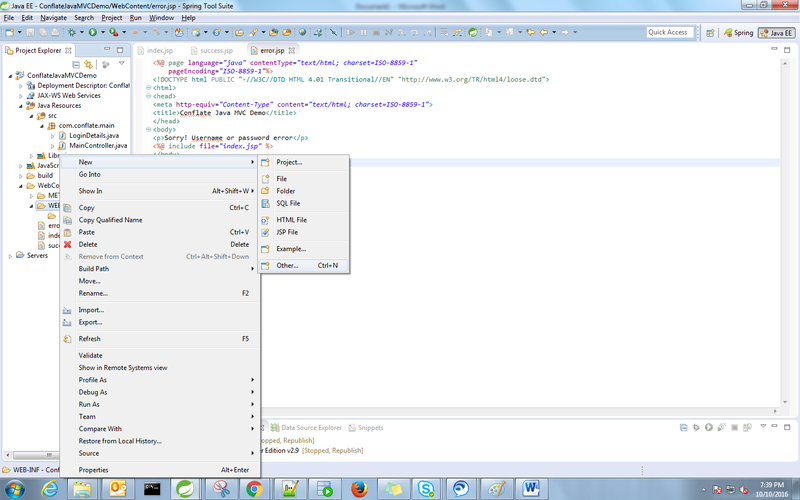 Select XML File from xml folder in drop down and click on Next. Name file as “web”.it will get saved in in WEB-INF folder. 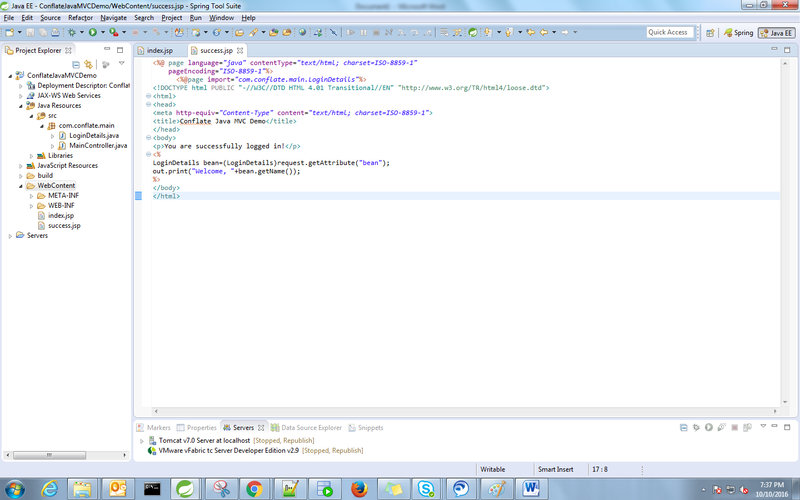 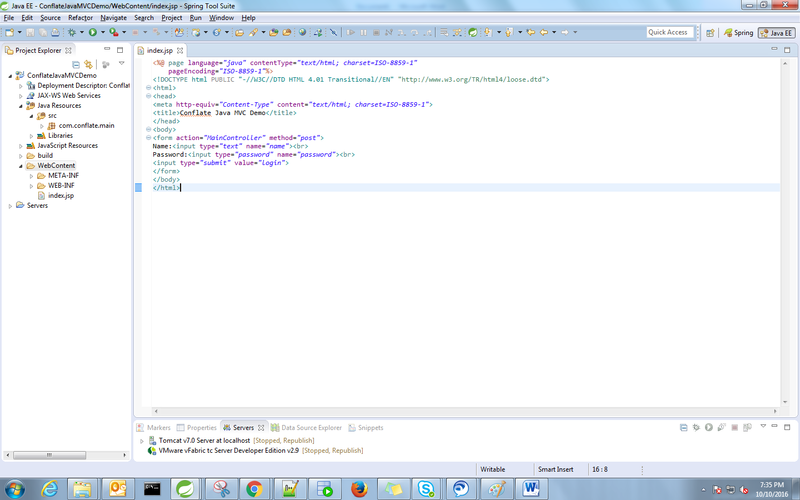 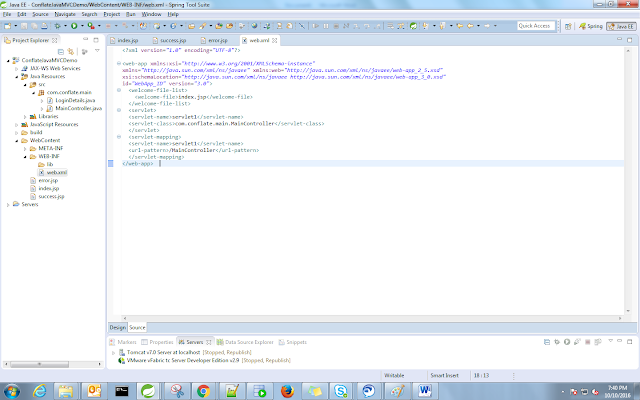 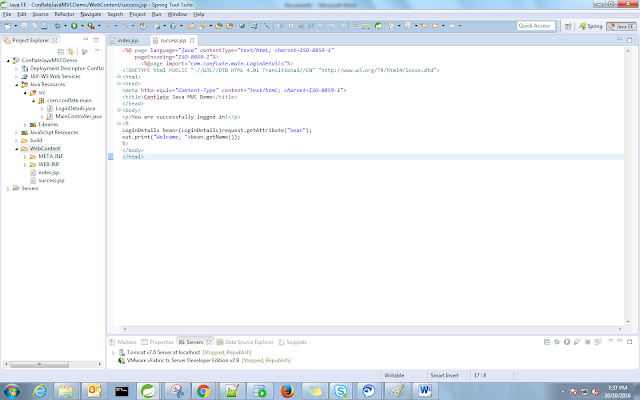 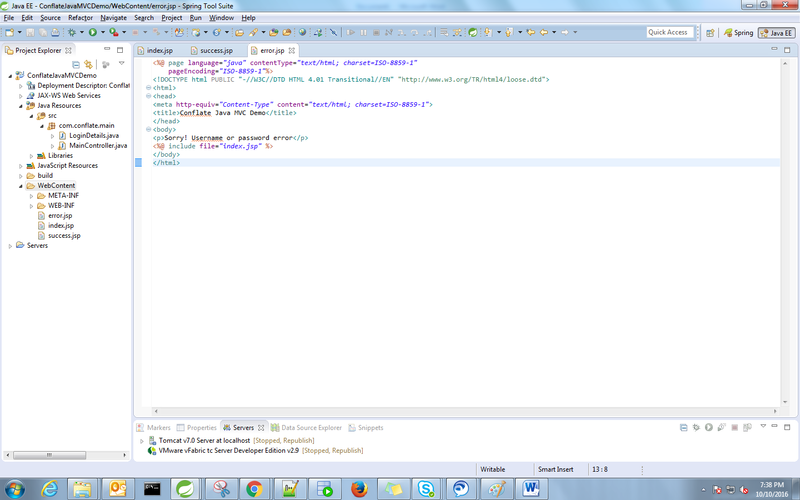 Web.xml file will get created.click on Source tab to write code inside this file. 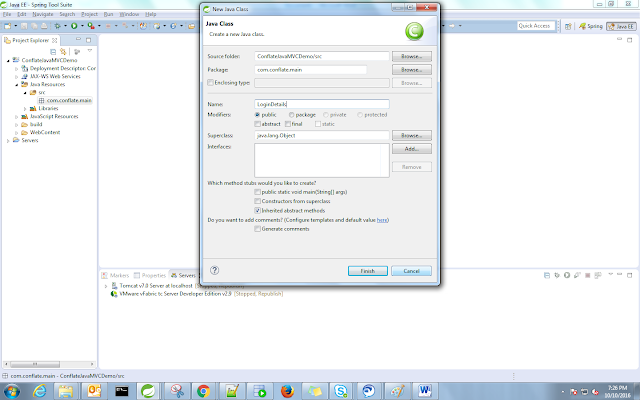 Enter Your Name and Password . 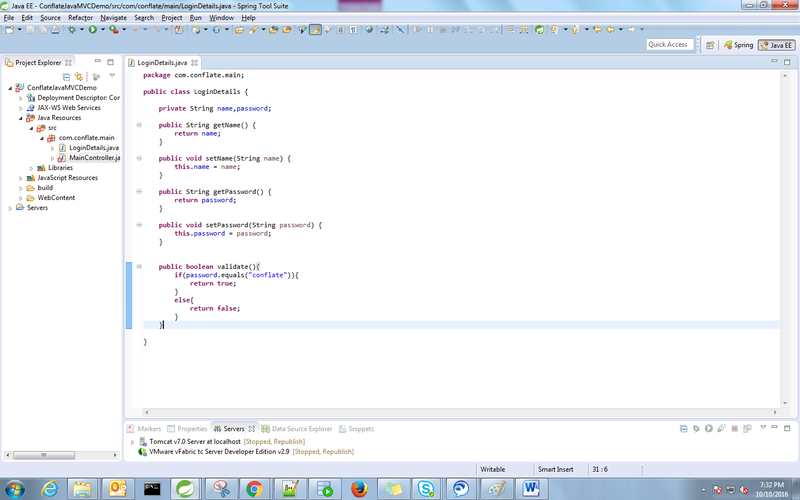 If you enter correct name and password present in Validate method present in LoginDetials.java class,you will get messaged succefully Loged into Application from success.jsp. 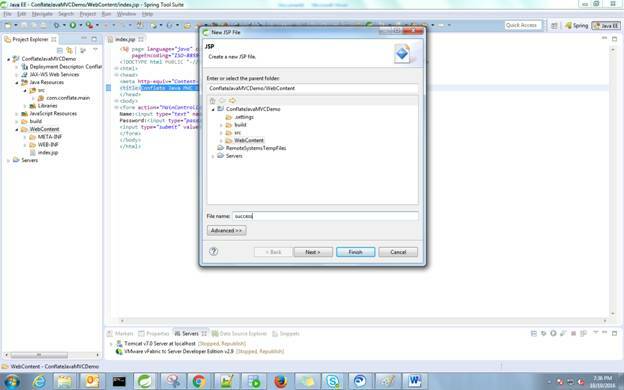 If you enter Wrong name and password then you will get error message from Error.jsp and redirect to login page(index.jsp). Comment below if face any issue we are ready to help you. Thank you for sharing this blog. 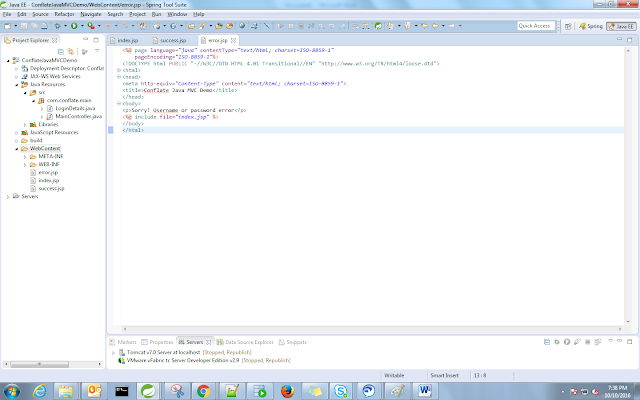 This blog will help to improve my knowledge. 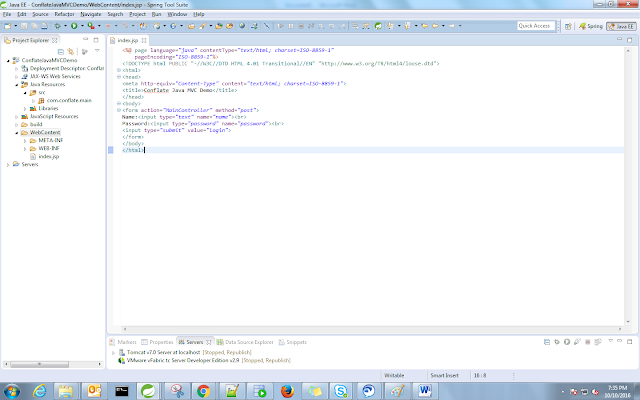 I feel happy to find your post, excellent way of writing and also I would like to share with my colleagues so that they also get the opportunity to read such an informative blog.